The Kruger Park, Swaziland and Lesotho tour forms part of the longer 20 day “Explore South Africa” tour South. On this tour you will see many of the highlights of South Africa, Swaziland and Lesotho. 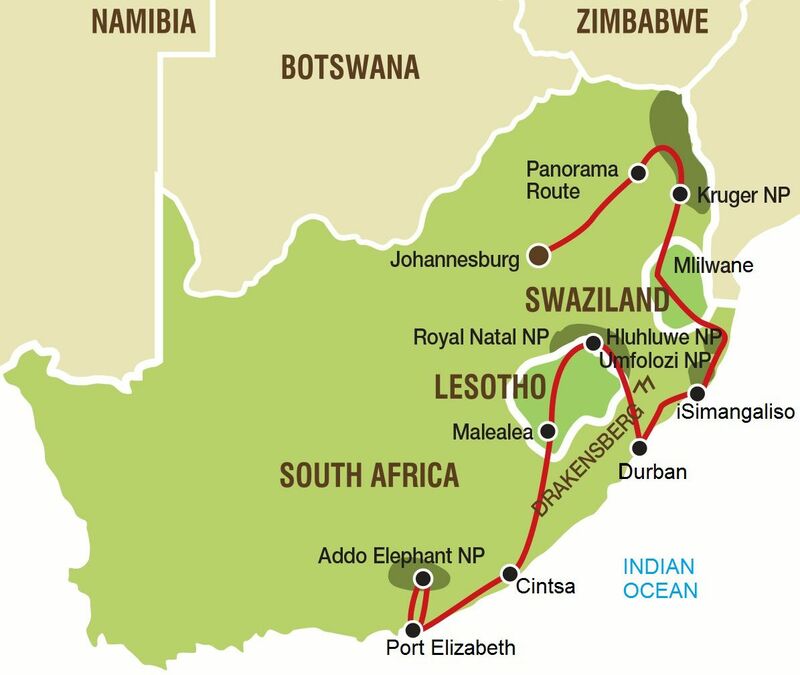 Your overland adventure tour starts in Johannesburg and ends in Port Elizabeth. This tour offers a great combination of wildlife safaris, beautiful natural landscapes and diverse cultures. 1. Camping: Clients mostly overnight in comfortable two-man dome tents, with built in mosquito nets and of course a mattress… and a couple of nights are upgraded to budget rooms. 2. Accommodated (hotels/ lodges): Clients overnight in a comfortable twin rooms or permanent safari tents, mostly with en-suite bathrooms. We begin our group tour and safari from Johannesburg to Port Elizabeth as we leave Johannesburg behind and travel east through the coalfields of the Mpumalanga province. Our journey today follows in the footsteps of the old trade-routes to the Lowveld and the Kruger National Park. This afternoon there will be an opportunity to join an optional sundowner drive. Booking is essential and your guide can assist on departure this morning. Rising early this morning we enter the Kruger National Park to enjoy a full day of game (wild animals) viewing (safari). The abundance of wildlife presents us with opportunities for excellent sightings and the Kruger is also home to the famed members of Africa’s Big-5. Truly the flagship of the South African national parks, Kruger is home to an impressive number of species: 336 trees, 49 fish, 34 amphibians, 114 reptiles, 507 birds and 147 mammals. Our activity package offers the added excitement of experiencing the park from an open-sided 4x4 vehicle. This evening there is a second opportunity for the optional Sundowner Drive. We start the day early with some coffee and traditional rusks before setting off through Kruger on our way to Swaziland. Our truck offers an excellent platform for game viewing as we make our way south. We exit the southern end of the park and travel the short distance to Swaziland border, our route this afternoon winds through the mountains and forests of this landlocked kingdom. Our destination for today is the Ezulwini Valley just south of the capital Mbabane. Endless hours of self-guided exploration within the small 4560ha Mlilwane sanctuary are possible due to the relative absence of dangerous game. This morning our guide will lead us out on a nature walk to explore the “ Nature Trail “ which provides interpretation of historical and environmental information of the area. Later this morning, we embark on a 2-hour guided walk through the Esijeni community, allowing us a glimpse of life on a day-to-day basis. This interactive experience could involve grinding maize, carrying water, building a wall or washing clothes in the stream. We bid farewell to Swaziland and re-enter South Africa, continuing south into the reaches of Zululand, once the realm of the mighty King Shaka who united the Zulu clans. This evening we are treated to a cultural experience where we will learn more of the Zulu traditions and language. Running the length of the Kwazulu-Natal province, the Ukuhlamba Drakensberg Park is a UNESCO recognised world heritage site. Whether you go by the Zulu name uKhahlamba, meaning 'barrier of spears', or the Afrikaans name Drakensberge, meaning 'dragon mountains', these towering mountains will be our backdrop for the next two nights. On our way we make a short stop in Durban to stretch our legs before continuing to view the scenic Howick Falls and a visit to the nearby site that marked the capture of South Africa’s most famous man, Nelson Mandela. We set out this morning for a day of hiking to explore the mountains of the Drakensberg, along our way we will have the opportunity to view examples of San rock art with a local guide. While we encourage everyone to make the most of the day in mountains, we may offer separate options depending on the activity level of the group. With a number of trails available we can ensure that we cater to every need, the most important aim is to ensure everyone enjoys this mountain paradise at their own pace. Our journey today begins with a mountain pass and an opportunity to visit a Vulture restaurant where we hope to view these fascinating birds. Our route winds its way through the magnificent cliffs off the Golden Gate National Park before we enter Lesotho in the afternoon, we pass the capital city of Maseru as continue the climb to our base high amongst the mountain peaks. Returning to South Africa, we descend the mountains and take aim across the Great Karoo. The semi-arid Karoo represents the heartland of rural South Africa and presents a stark contrast to the mountains we leave behind. Our overnight stop is set in the historic town of Graaff-Reinet, the fourth oldest town in the country. We cross the mighty Orange (Gariep) River today as we journey through the vast countryside of the Karoo. This evening you will have the opportunity to join a sundowner excursion to the Valley of Desolation. This unique valley offers a panoramic view over the town and the wide open plains stretching out below. Kindly note that during the winter months, this activity will become a Sunrise excursion to the valley of Desolation the following morning. Setting course for the coast once again, we pass through the open plains of the Karoo and the wildlife charms of the Addo National Park. Upon arrival in the greater Addo region, we set up camp and head to the National Park to enjoy an afternoon game drive in our overland truck, in search of the famous elephants that call Addo home. This morning your guide will transfer you to the city of Port Elizabeth where your tour comes to an end.